From an altitude of about 30 kilometres until after the second stage had taken over, the abort rules changed slightly once again. By this time, the vehicle was so high and the air was so thin that the canards at the top of the LET would not have been able to ensure that the CM was in the correct attitude for jettisoning the tower. Instead, the abort scenario required the crew to use an array of little rockets around the CM to bring it to the correct orientation. This system of rockets, the RCS, was one of the crucial systems on the spacecraft. 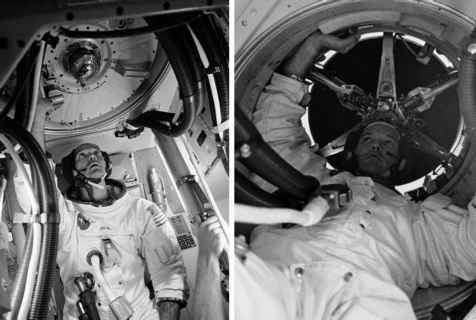 Both the command module and the service module had its own set and they were the only way the spacecraft could control its attitude when the larger propulsion systems were not operating, which was most of the time. Later spacecraft would use the properties of fast-spinning wheels to provide something against which the spacecraft could push when adjusting attitude, thereby saving propellant. The command module's RCS thrusters were only ever intended for use in an abort or in the final stages of an Apollo flight after the service module had been cut adrift.